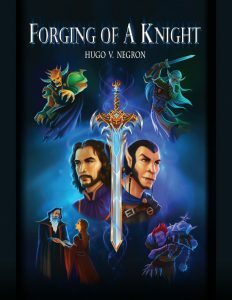 The first book in the Forging of a Knight series – ebook version on sale for .99 cents 10/6-10/14. A Halloween howl! A battle against the forces of Those That Stand in Shadow brings an end to an old hero and a beginning for a new one. Together with a half-orcne thief named Glaive, a young warrior named Qualtan must battle through undead hordes, shape-shifting maugs, hungry trolls, and more on his journey to become a knight. Along the way, he learns the world isn’t as simple as he first thought. Good and evil are not always what they seem, close friends can be deadly enemies, and loyalty can sometimes be rewarded with treachery. Even if Qualtan can grow from these lessons, a greater one will need to be faced: can an unexpected friendship with a thief of orcne blood, despised by all, support his chance for knighthood, or ruin it altogether?